Kerri McCrea, who graduated with a degree in Zoology from Queen's in 2013, has set up the Kindred Spirit Elephant Sanctuary – a non-for-profit foundation – dedicated to rescuing, rehabilitating and returning elephants to the wild in Thailand. In a recent interview in the Belfast Telegraph the 25-year-old Strabane woman outlined how she was horrified to witness the state many elephants were kept in in her adopted country, where an estimated 4,000 elephants are currently in captivity. In most cases, they are overworked – often for tourists – to the point of exhaustion. 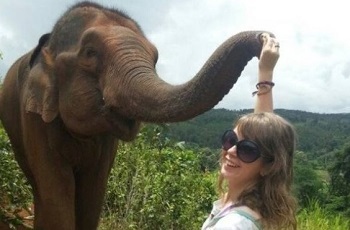 After graduation, Kerri moved to Thailand where she worked with various non-governmental organisations (NGOs), roles which saw her become involved with elephant projects. Not happy with what she witnessed, Kerri set up the Kindred Spirit Elephant Sanctuary with her Thai partner Sombat, who is from the Karen tribe. She told reporter Rebecca Black that having her eyes opened to the plight of working elephants in Asia sparked a passion, and that she has been working on ways to help the animals and to spread awareness of their plight ever since. “We have just returned four elephants to their natural habitat from the tourist camps," said Kerri. “Where our elephants were, was one of the worst sites of elephant tourism that there is. Every day they were working with saddles on their backs to the point of exhaustion. “It is a very, very complicated situation here. My boyfriend’s elephants were kept at the tourist camp which basically rented them, providing an income for their families. “I have seen elephants collapse from exhaustion that are then made to stand up and continue giving rides all day. There is no animal healthcare; they are not given the right food and are kept on short chains. They aren’t allowed to socialise or forage or to do anything that elephants normally do. With the help of visitors and volunteers, Kerri brings the elephants back to their natural environment where they live in semi-wild conditions – free to roam and to live how they choose. The Kindred Spirit Elephant Sanctuary works alongside animal owners, the local community and other organisations to try to bring a brighter future for all captive elephants. Among four elephants currently being rehabilitated in the Sanctuary is Too Meh – a 55-year-old female, who spent her early years working in the logging industry. When logging was banned, Too Meh ‘entertained’ tourists in holiday camps for 20 years giving rides in a howdah, an iron saddle that often leaves elephants with back problems. When not being worked, she was chained up with very little social interaction time. That is until now! Thanks to Kerri, Too Meh is now free to spend her days in the forest, roaming, foraging and interacting with daughter Mae Doom and grandson Gen Thong. “I love seeing the elephants get back to nature after having no freedom or choice of what they are doing. On the day they are released there is so much rumbling and so many squeaks from them because they are so excited to be back where they should be,” added Kerri.